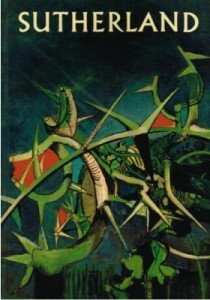 Graham Sutherland was born in Streatham near London. After an apprenticeship he worked as an engineer for the railroad but went on to study at Goldsmiths’ College School of Art in London from 1920 until 1925. His early works consist mainly of landscapes with surrealistic overtones. In 1936, Sutherland’s works were displayed at the International Surrealist Exhibition in London however after an assignment as an official war painter during the Second World War he met and became friends with Francis Bacon and subsequently changed the subject of his paintings. In the 1950’s, Sutherland found his strength in his portrait painting, which show unmistakeable marks of Bacon’s influence. His portraits include one of Winston Churchill, which was unfortunately destroyed on order of the testament of Churchill’s wife. Sutherland participated in many exhibitions which confirm his international reputation, including the “documenta” in Kassel in 1955, 1959, and 1964, as well as retrospectives at the Tate Gallery in London in 1982, in France in 1998, and at the Dulwich Gallery in London in 2005.